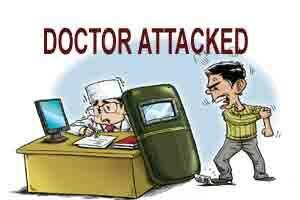 Patna: The son of a RJD MLA and a police official allegedly thrashed two doctors in separate incidents in Gaya and Madhepura following which the medical fraternity in the state observed a strike in Madhepura. In Gaya, son of RJD MLA from Aatri Kunti Devi allegedly thrashed doctor of a Primary Health Centre at Neemchak Bathani in Gaya district. As per complaint registered by the victim doctor Satyendra Kumar Sinha, the MLAs son Ranjit Yadav and his accomplices allegedly asked the doctor to show them the attendance register of employees and when it was not shown to them, they severely beat the doctor hurling furniture at him. The victim is undergoing treatment at a government hospital in Gaya. Officer in-charge of Kotwali police station Nihar Bhusan where FIR has been registered against Ranjit Yadav said search is on for the absconding MLAs son. Secretary of Gaya unit of Indian Medical Association (IMA) Bihar chapter Umesh Verma said a meeting of doctors has been called this evening to decide going on strike if the MLAs son is not arrested. Ranjit Yadav has been earlier booked in 2012 in connection with killing of a JD(U) district level leader Sumrit Yadav. In another incident at Madhepura, an officer in-charge of a police outpost allegedly beat up a doctor of an Additional Primary Health Centre (APHC) for arriving late for unfurling of flag on Republic Day at the APHC yesterday. Officer in-charge of Belari out post Krityanand Paswan joined the agitated public over delayed arrival of the doctor Shrawan Kumar Yadav for hoisting of flag yesterday and mercilessly beat him up. The victim doctor is undergoing treatment at Sadar hospital. The Officer in-charge of the outpost has been suspended by Madhepura Superintendent of Police Kumar Ashish. The accused is absconding.